We’d love your help. Let us know what’s wrong with this preview of Metamorphoses of the Werewolf by Leslie A. Sconduto. To ask other readers questions about Metamorphoses of the Werewolf, please sign up. This book by Leslie A. Sconduto was very interesting for me. What must be said however is that it is really very factual so it is not for beginners. Those who have a genuine interest in the development of the werewolf in literature should not miss this book. It deals with the most popular stories of werewolf literature from antiquity to the Renaissance to the werewolf trials. Although the author goes into more details on historical werewolf cases and views on the possibility or impossibility of m This book by Leslie A. Sconduto was very interesting for me. What must be said however is that it is really very factual so it is not for beginners. Those who have a genuine interest in the development of the werewolf in literature should not miss this book. It deals with the most popular stories of werewolf literature from antiquity to the Renaissance to the werewolf trials. 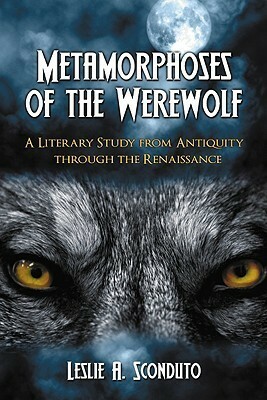 Although the author goes into more details on historical werewolf cases and views on the possibility or impossibility of metamorphosis, as that of Jean Grenier (interestingly enough, the description of his alleged wolf form is more fitting for a dog than a wolf), the main focus is still on the development of the werewolf in literature and not in folklore. What is also a plus for the author is that she stays with werewolves and doesn't call something entirely different a werewolf as some author modern authors are prone to do. She analyzed the stories in detail and goes so far as to analyze some of the puns of the authors. Later, she shows the French werewolf trials related to the reality of that time and her views on why there and then the phenomenon of blood-thirsty werewolf appeared again in such form and such a scale in appearance are very revealing. Also, she mentions the views of the famous church fathers about the physical transformation from human to animal, one which is important to understand the background of fictional werewolf tales of those times. This is a fascinating look at how portrayals of werewolves have changed over the centuries. Though very scholarly, it's very accessible; I had no trouble following it even though I only have a passing familiarity with medieval French literature. Sconduto looks at primary literature from each period (primarily French lays, romances, and court documents) and provides passages both in the original language along with an English translation. What I found most intriguing about this is the tie back to This is a fascinating look at how portrayals of werewolves have changed over the centuries. Though very scholarly, it's very accessible; I had no trouble following it even though I only have a passing familiarity with medieval French literature. Sconduto looks at primary literature from each period (primarily French lays, romances, and court documents) and provides passages both in the original language along with an English translation. What I found most intriguing about this is the tie back to the culture at the time each example was written. It was interesting to see how the then-current events influenced the werewolf narratives, and how the changing events engendered such drastic changes. Is it wrong to really like a book I needed to read in order to write a paper? Will definitely be revisiting this one day.